The longtime member of DCT writes prescriptions for laughter on and off the stage. As the first employee back in 1984 at the Dallas Children’s Theater (DCT) and a current artist-in-residence, Karl Schaefer has spent more than three decades applying his unique talent, unyielding energy and impeccable comic timing to countless DCT productions. 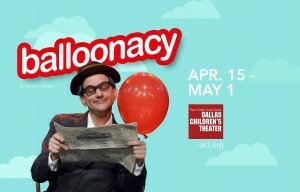 His art will shine for the second straight season in the DCT production of BALLOONACY – running tonight through May 1. As if juggling everything at DCT wasn’t enough, Karl threw one more ball into the mix. Last fall, he took on the role of a doctor. Or was it a clown? It actually was both. Karl is among the newest members of the Funnyatrics Clown Program at Children’s HealthSM – a nine-member clown troupe dedicated to making life better and a little funnier for children. 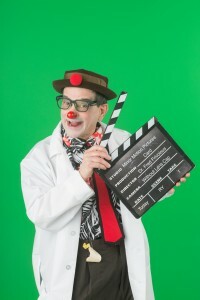 As Dr. Fred Frivolous in the Funnyatrics clown troupe, Karl and his very big shoes walk the halls of Children’s Medical Center Dallas and Plano, visiting patients and making a difference. He uses his many talents to bring some serious joy to kids who are going through some serious medical issues. Whether it’s a little juggling, a funny joke, some magic or an upbeat musical ditty, Karl plays an important role in the healing process by offering kids an outlet – to just be kids. And now Karl’s full-time and part-time gigs are coming full circle. Children’s Health is a proud supporter of the DCT and a sponsor of the 2016 production of BALLOONACY. “I’m looking forward to continuing my role at DCT and my new role as Dr. Fred Frivolous, the clown who writes prescriptions for joy,” exclaims Karl. After all, sometimes laughter is the best medicine.